I am taking a short city break in Athens, thanks to a very generous present last Christmas. I am spending the next three days in a fifth-floor apartment on Karaisaki Street in the Psiri area, only five minutes walking distance from Monastiraki metro station, and close to the Acropolis. I travelled on an early-morning Ryanair flight from Dublin and arrived in Athens late at lunchtime. I have been in Greece, on average, three times every two years since the 1980s, and this is my third time in Greece in the space of 13 or 14 months, including holidays in Crete in June and July. But this is my first visit to Athens since 2006. I first visited Athens in 1989, and when I was working as a journalist I was a regular visitor to Athens, sometimes visiting the Greek capital twice a year, writing for The Irish Times on political, cultural and religious life. Later, I visited Athens for family reasons, to research the lives of Irish Philhellenes, and during stopovers on visits to Church and mission projects in Egypt. Later still , I even contributed to the late-lamented Athens News in 2009 before it closed in 2012, and from Rethymnon in 2013 to EnetEnglish, a division of the Athens-based newspapers, Eleftherotypia (Ελευθεροτυπία). A lot has changed since 2006. I have booked a visit to the new Acropolis Museum tomorrow morning, and a walking tour of the Acropolis, all within walking distance of the apartment. Although this is supposed to be a city break, I hope to see at first-end the effects of the Greek economic crisis on the streets of Athens, to see the work of Canon Malcolm Bradshaw and the parishioners of Saint Paul’s Anglican church on Athens with refugees, migrants and asylum seekers. I am also conscious, with the ugly displays of the far-right on the streets of America in the past week, that this year marks the fiftieth anniversary of the coup that brought an end to democracy in Greece and brought the colonels to power in 1967 with the active intervention of the CIA and American might. I am thinking this evening of the heroic resistance of political, artistic, musical and literary figures who stood up fascism in their own country and responded to the moral compunction to take a stand at great personal cost. Later this year, the great Greek singer Maria Farantouri (Μαρία Φαραντούρη) celebrates her 70th birthday on 28 November 1947. She was one of the many notable voices that was active against the junta (1967-1974), when she worked with Greek composers such as Mikis Theodorakis, and poets such as George Seferis. During the weekend, I may also get to see two streets in central Athens names after two Irish Philhellenes. Despite its spelling, Tzortz Street (Οδός Τζορτζ), often transliterated as George Street, is named after Sir Richard Church from Cork, who was commander-in-chief of the Greek army and a senator. This street is off Akadimias Street (Οδός Ακαδημίας) close to Omonia and the Polytechnic. Eduardo Lo Street, off Panepistimiou Street (Οδός Πανεπιστημίου, ‘University Street’), is named after Sir Edward Law, who was born in Rostrevor, Co Down, and spent his childhood in Dublin. He was the Greek Finance Minister in the late 19th century is credited with rescuing Greece from one of its early economic crises. I am also a short distance from Richard Church’s house in Adrianou Street in the Plaka, on the northern slopes of the Acropolis, from his grave, and from Saint Paul's Church, where there are windows and memorials dedicated to his memory. I am thinking of having dinner somewhere in the Plaka this evening. Join me over the next few days as I walk around the streets of Athens and get to know the city again. 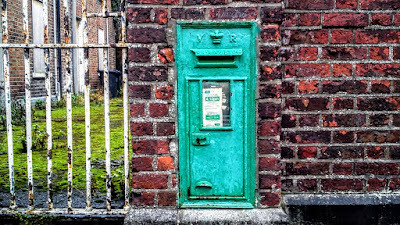 For six years or more, I have occasionally taken photographs of old post boxes and pillar boxes that predate the formation of the Irish Free State and a separate Irish postal service in 1922. They are spread throughout the country, from Co Mayo to Co Wexford, and from Co Louth to Co Wexford. I have not gone in search of them with any purpose or method, so my collection of almost four dozen photographs, from eleven counties, is representative only of places I have visited in recent years, and of how alert I was on any particular day. Most of these post boxes and pillar boxes are embellished with royal monograms. The simpler boxes inserted into walls, have plain ‘VR’ initials with crown insignias, while the stand-alone tubular pillar boxes often have the ‘VR’ initials in a cursive flourish, but despite the decorative approach have no crowns. The initials become more elaborate in the calligraphic flourishes that adorned them during the reign of Edward VII, but they return to more simple fonts in the reign of George V reflecting not only the harsh times of World War I and the War of Independence but also the design and development of new typefaces for typography and printing that emphasised clarity and legibility. 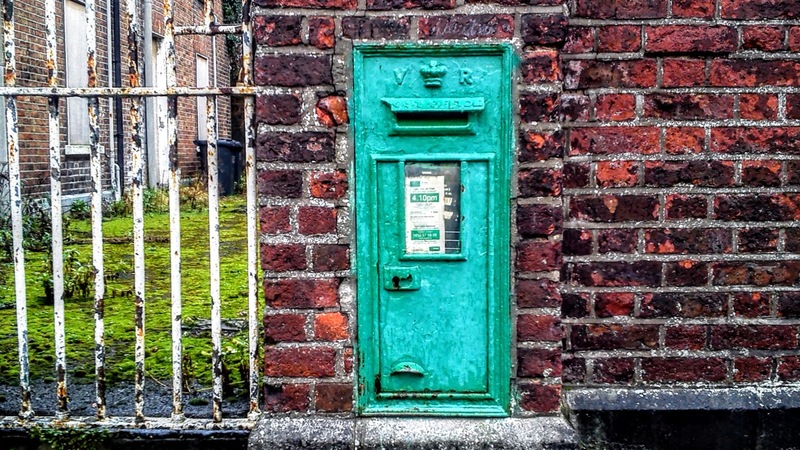 The green post box, in various shapes and sizes, is a familiar sight on city streets and country roads throughout Ireland. But all the post boxes illustrated here were originally painted in Post Office Red, and the embossed crowns were painted in gold, as may have been the lettering. The post box was introduced over 160 years ago by the novelist, Anthony Trollope, who worked for the Post Office in Ireland for several years. He wanted to make it easier for people to post their letters and make it unnecessary for them to have to wait for a post office to open. The first boxes appeared on the streets of cities like Dublin, Belfast and Cork over 150 years ago and they were introduced to other towns and villages from the 19th century on. The big pillar boxes were soon joined by smaller boxes that fitted into walls and later by lamp boxes that were cheaper to make and could be attached to lamp and telegraph poles. The first letter boxes were first put in place in 1855, when five boxes were erected in Belfast, Ballymena and Dublin. The first Dublin box was rectangular in shape and is now on display in the National Museum in Kildare Street, Dublin. By early 1857, pillar boxes had been placed in many Irish cities. The Post Office went on to put wall boxes in place throughout the island, and the cylindrical boxes were introduced in March 1879. A new design was introduced in 1887, incorporating the royal cypher on the door and the words ‘Post Office’ on the collar below the rim of the roof. Most of the early pillar boxes were painted dark bronze green throughout the United Kingdom, but in 1874 the Post Office decided to make pillar boxes more obvious by painting them a striking royal red. All the boxes illustrated here were originally painted in red, but after Independence the Irish Post Office changed their colour to green. A number of these old post boxes remain in use today and they are an elegant feature in many towns and suburbs. But many are neglected, left to rust, blocked up, and in some cases the royal insignia has been wilfully razed or filed away. They are an important element in the street architecture of Ireland, and it would be a shame if they were lost because of neglect or wanton abandon. The simplicity of the lettering on these boxes is enhanced by the royal ciphers. Although the boxes from the previous reign bore the initials EVIIR, these boxes bore the initials GR rather than GVR. It is almost like a premonition that an older order was passing that there would be no GVIR, or EVIIIR for that matter. The royal monogram or cypher has been filed away with intent on these three letter boxes, although in two cases the words ‘Post Office’ have been lift on the lid.